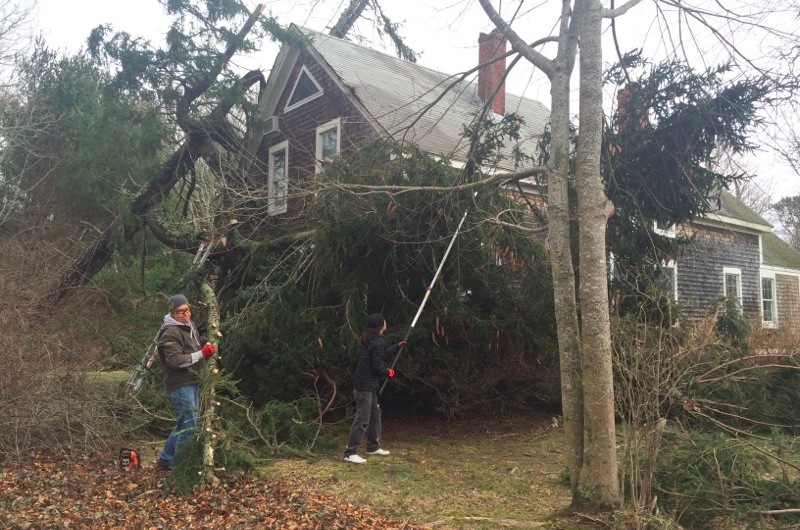 Recent northeasters led to hundreds of downed trees around the Island. Although the most recent storm this week did not live up to forecasters’ predictions, the winds were still heavy enough to cancel boats on Wednesday and Thursday, serving as a reminder, if anyone really needed it, that this has been a March for the weather record books. High winds, heavy rains and thick snow over the course of the month have left hundreds of fallen trees around the Island, blocking roads and damaging homes and property. “There’s been more damage than I’ve seen since Hurricane Bob,” said Dylan Bilzerian, owner of Bilzerian Tree Service. In the storm’s wake, Island emergency and clean-up organizations are reflecting on how they fared during the barrage of bad weather, and are looking ahead to how they can be better prepared for when the next one comes. Upgrading town phone and backup power systems, and improving communication with the public are on the forefront of plans by police and fire chiefs to make sure they can operate effectively in the future. 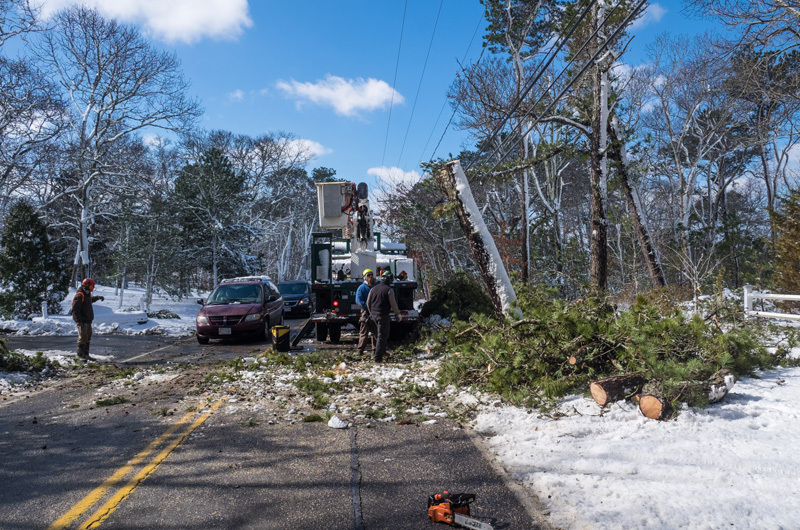 A massive power outage during last week’s blizzard raised the most issues, with Vineyard emergency response organizations dealing with numerous challenges from clearing roads to maintaining contact with residents in need. After high winds knocked out their voice-message system, members of the Chilmark police department weren’t able to listen to or respond to messages left on their answering machine. Cell service lasted only a few hours longer until the backup batteries on individual service provider nodes died. The backup batteries only last an estimated four to eight hours and are located outside. “Who’s going to go out during a storm and change a battery?” Chilmark police chief Jonathan Klaren told the Gazette. A generator supplied power to the station for the duration of the storm, but Mr. Klaren told Chilmark selectmen at their meeting Tuesday evening that potentially dangerous fumes from the exhaust filled the back of the station while officers spent the night there. He added that other than some fine tuning relating to the phone and backup power issues, no major adjustments are needed for future emergency response. 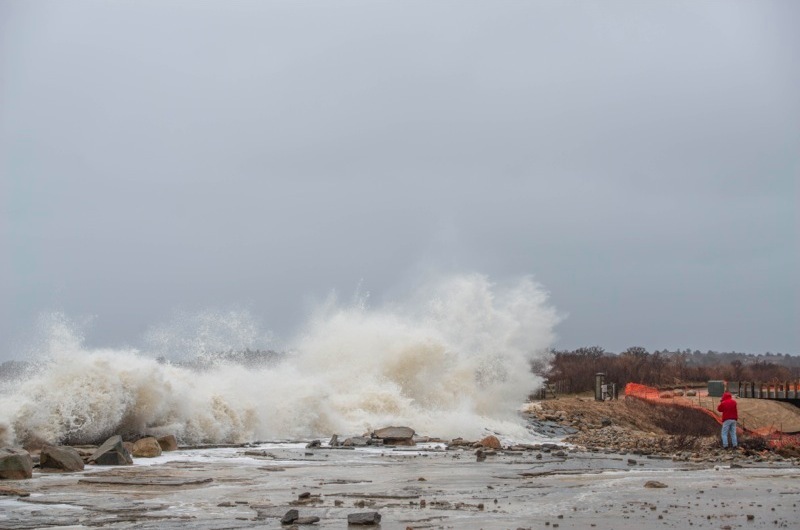 Aquinnah fared the worst in the last storm, losing power and phone service entirely. Even the police station was in the dark due to a broken generator, according to police chief Randhi Belain. Mr. Belain said that he will be meeting with the fire chief, highway superintendent and selectmen soon to make sure they can receive calls from distressed residents during the next emergency. Oak Bluffs fire chief John Rose said that a major concern of residents, especially during the power outage, was how to access community emergency resources. He added that the station received many calls from people unsure if there was a shelter they could go to or whether the Island even has an emergency response plan in place. Mr. Rose said that residents shouldn’t hesitate to contact the department if they ever require assistance during an emergency and that there are multiple resources available to help them. Cleanup during and after the storms has been a big issue. Grace Hagerty, co-owner of Hagerty Tree Service in Vineyard Haven, said that she’s received nearly 100 calls about tree damage since the first storm rolled through. Ms. Hagerty estimated that their tree removers have been on roughly 50 jobs since the storms began and that she had to put out an advertisement to hire more people to help. She added that many callers are customers they’ve never done work for; they just needed to get out of their driveway. Nicole Bilzerian, a partner at Bilzerian Tree Service, echoed Ms. Hagerty and said that the calls have flooded in for everything from uprooted trees to trees falling on houses. “It’s been absolutely crazy,” Ms. Bilzerian said. High-tide has hammered the coast and made Island harbor masters work overtime to ensure that boat and dock damage is minimal. 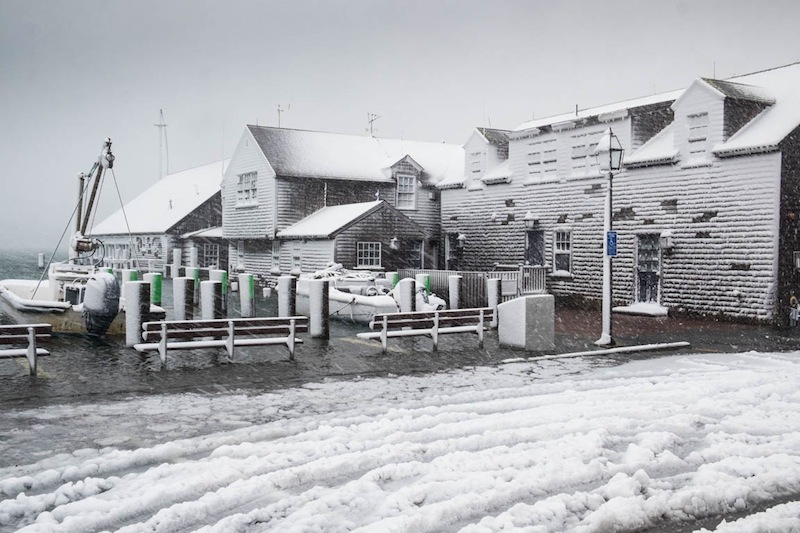 Charlie Blair, Edgartown harbor master, said that the rising tides left the Edgartown Yacht Club under two feet of water. Vineyard Haven harbor master John Crocker said he’s dealt with a few overturned boats, including the Witch of Endor, and a partly-collapsed pier. 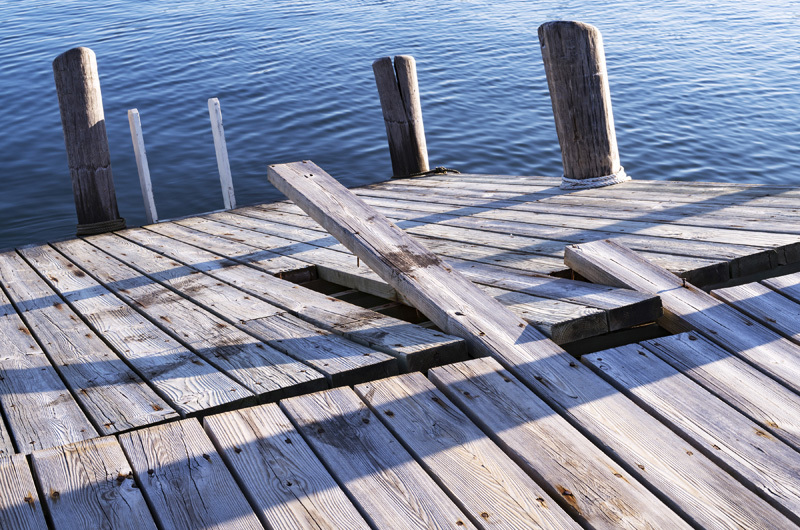 Mr. Crocker said the Owen Park pier sustained damage from the first storm on the south part of the pier where it branches into a T. Six pilings are also broken. He said the Mass. Department of Environmental Protection is sending him $35,000 in funding to repair the pier. As for the roads, Island highway superintendents said they held up well and only require the removal of tree brush still lingering after initial tree removal. Keith Emin, West Tisbury highway superintendent, did express concern over the state of flooding on certain roads, even after minor rainfall. He referred to Middle Road in West Tisbury just before Meeting House Road and said that anyone who travels on the road can see the flooding issue. Mr. Emin added that he’s spoken with selectmen about providing him with a bigger garage to work out of in the future since he is a one-man operation currently working out of storage boxes in a single-car garage. He said he’s been busier than ever, but the roads have all been scraped and the worst is over. “Hopefully next week we’ll have spring,” he said. Thank you so much to the the whole crew at Hagerty Tree for coming first day after the storm to help us out of our driveway! We really appreciated the service.